The Substance Use Issues in Youth & Community Work Course » Comhar Chathair Chorcai Teo, Cork City Partnership Ltd. The Substance Use Issues in Youth & Community Work Course (FETAC Level 5) is run in conjunction with Cork College of Commerce and is recruited for and promoted by CODAP. The course components are designed to promote good practice among those who work (in a paid or voluntary capacity) with young people and communities who are affected by substance use. This year over forty interested applicants attend a pre-entry taster / information session on the 4th of September 2013; this was followed up by the interviews in Cork City Partnership offices on Thursday 12th of September 2013. Twenty candidates were chosen from the panel of applicants and the course 2013/14 (which is rolled out over the academic year on a Tuesday evening) began on the 4th of September. 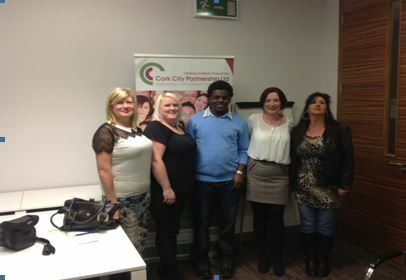 On the 11th of November 2013 a number of the thirteen graduates of the Substance Use Issues in Youth & Community Work Course (FETAC Level 5) 2012/13 received their components certificates in an event which took place in Cork City Partnership. This event was also held as part of Cork Drug Awareness Events (CDAE) November 2013 which were held across the month of November. Cork Drug Awareness Events is a series of Free Events which are run across the city to raise awareness, high light services and supports and sign post information, so that individuals, families and communities know where to go for assistance/information on drug and alcohol services.